Although the calorie content of a banana muffin varies depending on the brand, size and ingredients, a medium homemade muffin may contain about 220 calories. The calorie count rises, however, with added ingredients such as nuts, chocolate chips and icing. For example, 1/4 ounce of walnuts will add nearly 50 extra calories. 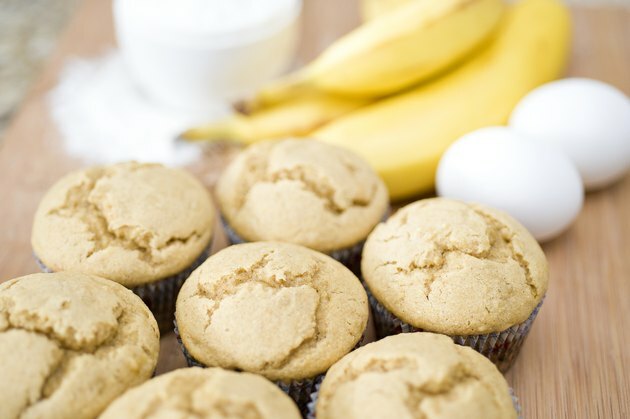 Most banana muffins are high in added sugar, which contains calories but no nutrients. More than half of the calories in a banana muffin come from carbohydrates, while about 36 percent come from fat and about 7 percent come from protein. The U.S. Department of Agriculture's 2010 Dietary Guidelines for Americans recommends getting 45 percent to 65 percent of calories from carbohydrates, 20 percent to 35 percent from fat and 10 percent to 35 percent from protein. For a more balanced meal, pair your muffin with an egg white or other lean protein source along with a fresh piece of fruit for fiber and vitamins.